2009 KTM 50 SX. Picture credits - KTM. Submit more pictures. Small, fascinating and unbelievably snappy � that�s how best to describe this miniature rocket. Not only does it look like the big SX machines, it also has virtually identical riding behaviour. Both the chassis and the engine have been completely newly developed, which makes the 50 SX a fantastic handling, unbeatable high-tech weapon. Frame type: Double grinded central double-cradle-type frame. Steel subframe. Seat height: 684 mm (26.9 inches) If adjustable, lowest setting. Ask questions Join the 09 KTM 50 SX discussion group or the general KTM discussion group. Get a list of related motorbikes before you buy this KTM. Inspect technical data. Look at photos. Read the riders' comments at the bike's discussion group. And check out the moped's reliability, repair costs, etc. 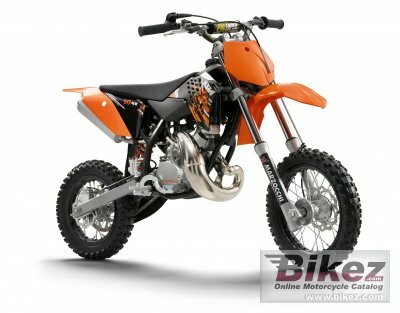 Show any 2009 KTM 50 SX for sale on our Bikez.biz Motorcycle Classifieds. You can also sign up for e-mail notification when such mopeds are advertised in the future. And advertise your old MC for sale. Our efficient ads are free. You are also welcome to read and submit motorcycle reviews.